Powers/Abilities: Skilled gunfighter and rider. History: (Kid Colt#1-201, All-Western Winners #2-4, Best Western #58, 59, Black Rider #26, 27, Ghost Rider I #1-6, Gunsmoke Western #32-72; Avengers Forever #4, Avengers I #141-143, Thor Corps #3, Black Panther III #46, 47, Kid Colt #202-229, Fantastic Four III #33, 34, Mighty Marvel Western #1-24, Rawhide Kid #50, 64, 67, Two-Gun Kid #13, 14, 16-21, Two-Gun Western I #8-14, Western Winners #5, 6, Wild Western #4-6, 9-11, 20-47, 52, 54-56, Blaze of Glory #1-4) Blaine Colt grew up on the Flying-C Ranch, near Abiline, Wyoming. The son of ranch owner Dan Colt, Blaine taught himself from childhood to use a gun, proving to be a natural with the weapon that was his family's namesake. However Blaine had a temper as quick as his draw, and realising this, he normally avoided carrying a gun, in case he killed someone in a fit of anger. Things changed when Dan Colt got into a conflict with the Ranchers Protection Association, a racket run by Lash Larribee. They swindled Colt out of his land, and then Dan Colt was killed under suspicious circumstances. Upon hearing this, Blaine grabbed his guns, rode into town looking for Larribee and his men, and shot them down in cold blood, even though they were unarmed. Wanted for murder, Blaine was forced to go on the run (dime novels (e.g. 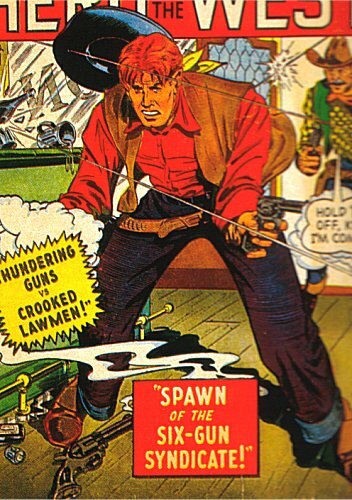 the original, Golden Age version of the origin story) would romanticise this to make it clear that Larribee had killed the senior Colt, something that wasn't certain, and change the murder Blaine committed to a proper face-off where he outdrew Larribee in a fair fight, only to be falsely accused of murder by Larribee's men). For more than a decade, Blaine rode the west, becoming famous as Kid Colt, a wanted man with a heart of gold and using his guns fighting on the side of the angels. He encountered and made friends with fellow gunslingers such as the Two-Gun Kid and the Rawhide Kid, and faced off against some of the West's most colourful villains. He even met time-travelling superheroes from the twentieth century, the Avengers. However he couldn't stay out of trouble, and by 1885 he was wanted for shooting a sheriff, and pursued by a number of lawmen and bounty hunters, including Caleb Hammer, the Pinkertons, and the Gunhawk. While Kid Colt was helping some old friends defend the town of Wonderment from raiders called the Night Riders, Hammer and the Gunhawk caught up with him. Both put aside their pursuit briefly in defence of the town, but at a choice moment, Gunhawk shot him in the back, killing him. Watching the Kid work to save the townspeople, Hammer had come to respect his prey, so when Gunhawk committed this cowardly deed, Hammer balanced the scales, and gunned down his fellow bounty hunter in retaliation.